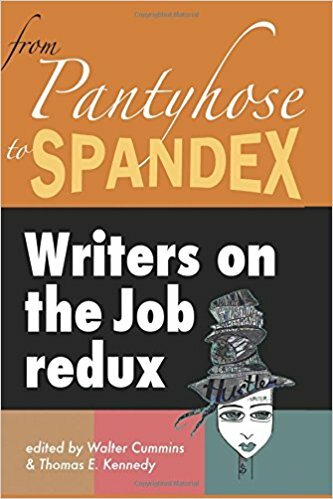 This month, we celebrate the publication of From Pantyhose to Spandex: Writers on the Job Redux. The book is a veritable cornucopia of odd true tales about zany jobs that writers do to keep the ink flowing. And it happens to feature some of Broad Street‘s authors. The editors, Thomas E. Kennedy (“Prix Fixe,” from our “Hunt, Gather” issue) and Walter Cummins (from the forthcoming “Small Things, Partial Cures”), have cast a wide net that takes literary laborers from Tiffany’s famous jewelry store (that would be Julie Anderson, whose essay on China featured in our “Maps & Legends” issue) to the wheel of a taxicab in Copenhagen, Denmark; a Walmart boot camp; various stints as pantyhose-wearing office workers (Susann Cokal of our editorial staff); brokering canned goods to grocery stores; and into the Spandex of a superhero costume. The book grew out of Kennedy and Cummins’s curated feature, “Writers on the Job,” found on webdelsol.com. “A Writing Junkie’s Tale,” Bill Mesce, Jr.
of—the ways in which writers put food on their tables. on writing—to the discovery of what makes us tick. Previous postContributor news: On the *Notable* Bea Chang and the river her father promised. Next postContributor News: Daredevil Costume Designer Paloma Young is Tony-nominated again! And brings plenty of snacks to the ceremony.